It is possible that as you walk with Jesus, you can find yourself caught in sin, caught in a place you know you shouldn’t be. It wasn’t planned, you didn’t wake up one morning and decide, “You know what, I don’t care anymore. I think I’m gonna ______ .” No, what we’re talking about here, what Paul was talking about, is more of being “caught by surprise.” Now, we could get into reasons for this “being caught,” but that’s another conversation. The fact of the matter is for whatever reason, you’ve been trapped. You’re still a disciple of Jesus, but somehow you’ve got yourself caught. Maybe even groups of believers are caught in this dilemma. You may be thinking, “Man, the whole church is caught!” What are we to do? Whether or not we’re dealing with an individual or larger groups of people, the emphasis is to be on restoration. So often, in our self-righteousness, we want to lash out, tell them the reason why they’re so messed up and make them feel good and guilty about their present state. (I’ve had this disposition, and I repent of it.) We think to ourselves, “If this person truly loved Jesus, he wouldn’t be all jacked up like this.” But notice, Paul says that we are to treat the ones caught in an offense with gentleness. In fact, this gentleness is a mark of true spirituality. It is not a condoning of sin, but compassion for a brother or sister (or the church) who is caught in an offense. It is a fruit of the Spirit (ironic that Paul lists these fruits in the preceding verses) in the lives of “the spiritual” that desires r estoration and freedom more than proving how spiritual they feel themselves to be. It’s one thing to point out sin and problems, but the truly spiritual man or woman has a heart of gentleness, a compassion and desire for those who are trapped to be restored. They are humble of heart for they know that they too, except for the grace of God, could be tempted and caught. When we see people who have been caught in the rain it’s so easy to think, “What an idiot!” Some folks (like the ones riding across the dam this morning) even ride by, and try to splash more water on you-to further emphasize your idiocy. But we should note that the truly spiritual desire to help bear the burden of those “caught in the rain.” The ones who are living by the Spirit are not content to sit back and pompously point out the obvious, they are willing to get a little wet themselves if that’s what it takes to help. They’re response is, “Do you need a ride?” or “Here’s an umbrella.” Instead of, “Man, you’re an idiot.” In this way the law of Jesus is fulfilled. They behave like the One who not only saw the sin, but totally assumed the dilemma, bearing it within Himself and providing the solution. I made it back across the dam this morning. You could say I got soaked to the bone, but I’ll say that I was “baptized” in the cleansing rain. Lover of Jesus, are you caught out in the rain today? Can I tell you that you will make it back? You’ve come too far to give up, and God’s grace is enough to see you through. I pray you learn from the downpour you find yourself in, that cleansing and renewed zeal towards God be yours on the other side. 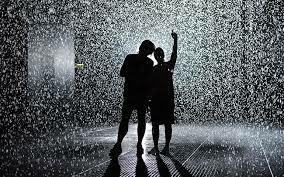 I pray the “rain” reminds you of your first love, and the One who first loved you. I pray that you reconsider the kind intentions God has for you in Jesus. The clouds will break, and you will walk in the Son.